The cold season is coming, and it's time for flannel jammies! Fortunately, we have a great selection of cotton flannel prints. Here are a few cute new ones. We now have two colors of Tyvek yardage available. This super-tough fiber has multiple industrial applications; we think it would also make great bags, purses, and fiber art! Treadlette Rebecca pieced this beautiful quilt and had it quilted by professional longarm quilter Nanette Sutherland. Rebecca used a panel print and coordinates from the same group. Nanette Sutherland offers an extensive array of quilting patterns. You can drop off your quilt top at Treadle and she'll quilt it and bring it back! Have a little fun with these whimsical new prints from Moda! We have some fantastic new digital knit prints! Gorgeous colors and intense details make a perfect statement. We have a new group of cottons printed with selections from Claude Monet's famous Impressionist paintings. The rich colors and soft beauty of these prints are simply breathtaking! Both of the allover floral prints coordinate with the large panel print! We have some new lovely new Ponte knits! All the body and drape you love about Ponte, in a lighter weight! Like all of our newest Ponte, these are a rayon-rich blend, with less poly and less pilling! Hi, Elizabeth here, and this Treadlette Tuesday I thought I'd share one of my own recent projects! I made this c. 1560s style kirtle from wool using a pattern from the wonderful book The Tudor Tailor. Historically it would have been sewn all by hand but I used a combination of hand and machine sewing. The sleeves are also wool, and the shift and cap are made of handkerchief linen. I wore this to a costume convention and I'll also be wearing it to the Minnesota Renaissance Festival! If you've ever had trouble finding the perfect finishing touch for a project, Custom Trims And Buttons class at Treadle is for you! Perfect, crisp pleats are simple (when you know the secrets!). Make full, gathered ruffles out of any fabric you like! Create soft flowers out of fabric or ribbon! Learn the easiest ways to make coordinating buttons. Or try a fun contrast! Or a delicate, lacy, thread worked button! And so much more! Use bias cut fabric strips to make your own ribbons, bands, and piping! Twist threads and cords to make a custom blend! Combine multiple trims and stitches for a totally unique result! Learn to apply your custom trims to bridal and special occasion sewing, casual garments, or home decor, whatever you love to sew! This class is Wednesday, Sept 27 and Oct 4, 6:30 - 9:30. To sign up, call us at (651)698-9690. See our complete class schedule here. Our new Liberty Tana Lawn prints are in darker shades perfect for Autumn! New Indian imports from Wool Gathering Company are starting to arrive at Treadle! Soft, handloomed cotton and silk yardage, plus an array of lovely scarves! The lovely Roberta was good enough to model one of these gorgeous scarves for us! Please note the charming care instructions. Call your mother. We are so thrilled to be carrying the wonderful products from this great company! Come in and take a look, and keep looking for more in the future! We have some great new colorful denim fabrics in the store! These new cotton prints are 108" wide! Perfect for quilt backs, duvet covers, extra-long curtains, or sheets! Jess has been sewing since she was 10 years old, and has been a lifelong Treadle shopper. She has lovely memories of sitting playing with toys while her mother shopped. She loves garment sewing, mostly for her children when they were small. Most of our kids' classes are taught by our wonderful Jess. She's got a real knack for keeping kids engaged and enjoying sewing! Jess is also an avid (obsessed) toy maker. Her favorite thing she ever did was design a toy rocket which was featured in the first One Yard Wonders book. Look for her Soft Stuffed Friends class coming up this winter at Treadle! Two weeks until Kenneth King is here! There will be door prizes, great stories, and a chance to see Kenneth’s garments up close. Plus, attendees will enjoy a 15% discount on all purchases at a private shopping party at Treadle on Saturday evening. Come for refreshments and get help with fabric selection and inspiration from Kenneth himself! 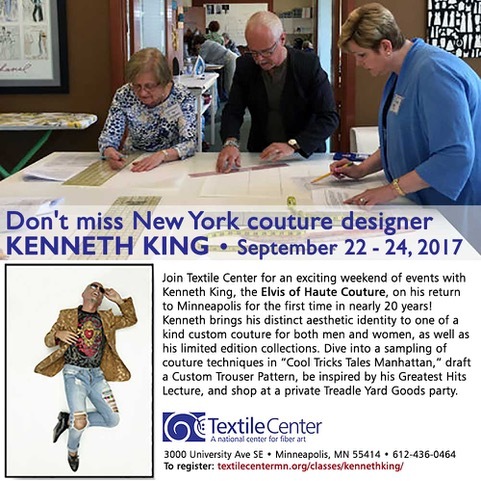 Register at the Textile Center for classes and lecture. Click here for registration info! Then call Treadle to register for the private shopping party at 651-698-9690.